I did not think I would blog today. Too tired to cook, I'd bought a packet of roast duck and char siew rice from a food court which I consumed relatively early, anticipating a very early turn-in. By 7.45pm, I was freshly minted from a close encounter with my toothbrush and clad in my robe reading a book before bed. My friendly bookstore keeper had recommended it to me knowing my love of any books that even has a hint of culinary pursuits or theme. It's a murder mystery involving a caterer and apparently the writer has been so successful that there is now a whole series of them. Personally, I cannot quite understand why. Her writing is puerile and the recipes she listed were dull, unimaginative, common and (no-offense to any American friends out there) what I call middle-American country boring. The prose was stilted and awkward and worse still, the author, Diane Mott Davidson, employs a cutsey style of writing in the guise of humour that is as entertaining and mature as Paris Hilton. Example A - the protagonist's name is Goldilocks Bear. 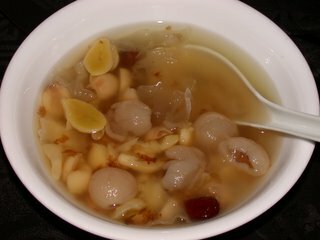 Example B - one of her dishes for an aphrodisiac night is Shrimp Dumpling Soup. Look, unless you were going to use it in ways which shall never darken my blogspace, any kind of dumpling is not a aphrodisiac unless you consider stodgy food wild monkey love cuisine. I was just surprised she did not use the word "hott" in her writing. I have not finished the book yet but already I am uninspired to plow through the rest of the chapters. You see, I'd already figured out who dunnit three chapters ago ... I happen to be at Chapter 7 right now. It puzzles me how a book could have garnered enough readers to warrant a second, what more a whole series of books. I'd much rather read Chocolate & Zucchini, Kuidoare, or any one of the fantastic food bloggers out there. In fact, I think I can probably write a better book than this author! Not being an arrogant wanker but seriously, the book is really that lame. It is certainly no Like Water for Chocolate or Chocolate which successfully and beautifully twine delectable and exciting recipes into the lush fabric of fiction. I'm going to give my bookstore keeper a piece of mind for insulting my intelligence. Just as I was ready to call it a night, a knock thudded softly on my bedroom door. Yes, a single knock. My housemate's signature knock, actually. My housemate shyly asked if I'd had dinner and seemed really disappointed when I told him I had. He informed me he'd brought back some homemade cheng teng from his future mother-in-law's which he would like me to try. Homemade cheng teng! I can always brush my teeth again! Lay off, McDuff ... and damned be he who comes between me and my cheng teng! I love cheng teng. But homemade cheng teng is even better! My housemate has scored high on my likeability scales by bringing home a tubful of this refreshingly delicious traditional Chinese dessert. A sweet, clear soup of white fungus, lotus seeds, gingko nuts, dried longans and red dates sweetened with rock sugar, cheng teng is the best dessert on a hot, tropical day. Or night in this case. It cools down your system and helps alleviate sore throats and women adore this for it's supposed complexion clearing benefits. I just like the taste. It's like an extremely exotic fruit soup. And I think the perfect thing to have to sweeten my dreams tonight. Bless! Sorry for posting this as a comment - I couldn't find an e-mail contact address. Oh Hi Db, thanks for visiting and for the compliment. Yes, I have signed up - appreciate the invitation. I saw Sam of Becks & Posh so I reckoned it was worth signing up! Glad to be the 1st blogger from Singapore. Perhaps some of the other friends who visit here may like to join up too. It's always nice to meet people who lives to eat! Hey Penny, thanks! I do indeed love my food ... and being in Singapore really enables me to indulge that! You must miss the food terribly. Thanks for visiting!